Wedding vows are more important to a wedding than the photography, cake, and catering combined, but they don't often receive the same attention. The little words that marry you and your spouse give meaning to everything else that happens during your wedding day. Additionally, the promises that you make to one another during the ceremony set the tone and parameters of your marriage. You want vows that are perfect for your big day. When deciding on your wedding vows, consider the type of wedding celebration you are planning. Will it be a traditional or modern ceremony? Keep in mind if you prefer a romantic or casual wedding vow style and whether you want to add a special, personal touch by writing your wedding vows yourself. Finding the wedding vows that are right for you gets easier the more that you read them. Look at all of the types of wedding vows available and see what feels right to you, beginning with this big list of sample wedding vows. Some religions insist that you use the canonical wording, but others may allow you to also include personal vows. Even if your religion does not require it, combining classic and non-traditional wedding vows can be a way of honoring tradition, while also personalizing your ceremony. Reach out to your institution in this scenario so you can create the wedding vows that are right for you. 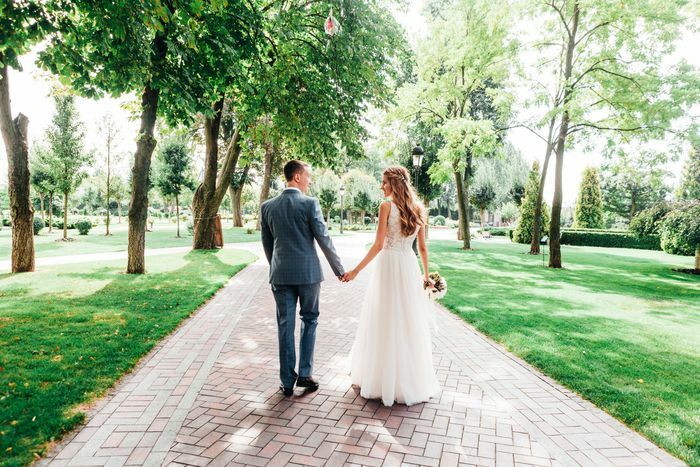 Consider the difference between traditional wedding vows and non-traditional wedding vows when it comes to planning your wedding vows and writing them. Talk to your future spouse and the officiant to make sure everyone is on the same page. Answer a few questions in writing. Example questions include "What does marriage mean to you?" "When did you know you were in love with your future spouse?" and "What is your favorite memory of your partner?" Read example wedding vows, poetry, and love stories. Highlight passages that speak to you. Put it all together. Pare down and select the best material you highlighted. Take a sentence or two from literature, include "I promise" or "I vow" and make personal comments about your partner or about marriage in general. Leave blanks where you aren't sure of the wording yet. Fill in the blanks in your proposed vows. If it helps, start over with a short, simple vow. Read the vow out loud to a trusted friend who can help you polish the language. "(Name), today I take you for my (wife/husband). I promise to love you without reservation, comfort you in times of distress, encourage you to achieve all of your goals, laugh with you and cry with you, grow with you in mind, and spirit, always be open and honest with you, and cherish you for as long as we both shall live." Be careful with using humor in your vows. Your wedding day is special and your vows should reflect that. Look at other examples of humorous wedding vows to see how other couples walked the line between laugh-out-loud funny and warm humor. In addition to marriage vows, many couples also say special words as they exchange wedding rings. These ring ceremony wedding vows can be heartfelt or silly, poetic or straightforward. They can be secular or customized to the couple's religion. Some have a phrase from the ring vows engraved inside the ring.